Did you know that bacteria can actually communicate with each other? Bonnie Bassler, a microbiologist at Princeton, has discovered how bacteria communicate with each other and describes how they use chemical molecules and enzymes to communicate. Her research focused on the molecular mechanisms that bacteria use for intercellular communication. She found a gene these bacteria use to sense whether they are part of a dense or sparse population of bacteria -- for example, whether they are living in the human body, as opposed to a puddle of water. And she discovered that more common and more dangerous bacteria have the same gene. The gene could become a valuable tool to drug developers looking for new ways to attack bacteria that are becoming increasingly resistant to current treatments. In some cases, bacteria only start emitting the toxins that cause disease after they multiply and develop into a dense population. Bassler found this molecular signal after years of studying certain luminescent bacteria that are widespread in oceans but are harmless to people. Her work focuses on figuring out how and why two species, called Vibrio harveyi and Vibrio fischeri, emit a blue glow. In a petri dish, the arrow contains a mutant form of V. harveyi. 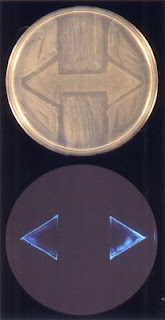 On the left is a patch of E. coli that causes intestinal infections; on the right is Salmonella; in the middle, above and below the stem of the arrow, is a lab strain of E. coli that has lost its ability to harm people. In the dark (bottom photo), V. harveyi glows in the presence of the two pathogenic bacteria but not the harmless one.